This manuscript was originally compiled in 1380 by Thomas Walsingham, the precentor of the Benedictine abbey of St. Albans, as a record of those who had made gifts to the abbey. The manuscript includes a list of the abbots of the abbey. 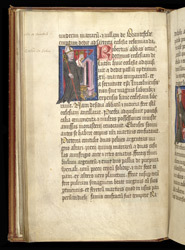 This miniature shows Abbot Robert (1151-1166), standing next to some of the gifts mentioned in the text: buildings, an image of the Virgin and Child, and a censer.